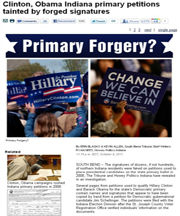 Home » News » Do elections really get rigged in America through Forged Petitions? Do elections really get rigged in America through Forged Petitions? Click to Enlarge 400% and read entire article. Click Twice. If you thought the recent George Clooney movie “Ides of March” made the political process seem a bit less than “ethical”… you should read about the reality of forged ballots in Indiana. 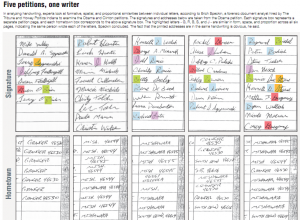 The signatures of dozens, if not hundreds, of northern Indiana residents were faked on petitions used to place presidential candidates on the state primary ballot in 2008, The Tribune and Howey Politics Indiana have revealed in an investigation. Several pages from petitions used to qualify Hillary Clinton and Barack Obama for the state’s Democratic primary contain names and signatures that appear to have been copied by hand from a petition for Democratic gubernatorial candidate Jim Schellinger. The petitions were filed with the Indiana Election Division after the St. Joseph County Voter Registration Office verified individuals’ information on the documents. St. Joseph County Prosecutor Michael Dvorak’s name appears twice on the Clinton petitions. After The Tribune faxed one of the signatures to him, Dvorak identified that signature as his own and confirmed that he had signed the petition. Dvorak did not respond after a copy of the second signature on the same petition was faxed to him by The Tribune. Spokeswoman Lora Bentley later said the prosecutor could no longer comment on the matter because it was now under investigation. Falsifying a ballot petition is a Class D felony in Indiana. According to Dale Simmons, co-legal counsel for the Elections Division, the statute of limitations for Class D felonies is five years. The Tribune has talked with more than 30 people besides Dvorak whose names are on both the Clinton and Schellinger petitions. 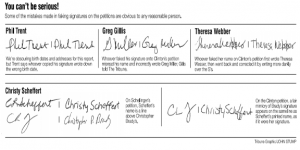 All but one of them have confirmed their purported signatures on the Clinton petition are not genuine. 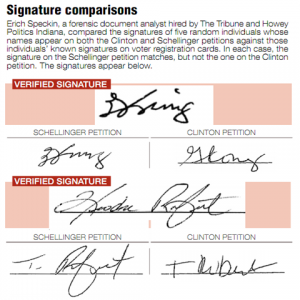 Example: View signatures of five random individuals whose names appear on both the Clinton and Schellinger petitions against those individuals' known signatures. Click on above photo to enlarge 400%. Erich Speckin, a forensic document analyst, examined the petitions at the request of The Tribune and Howey Politics. Example: See some of the obvious mistakes that are clear to any reasonable person. He said there is clear evidence, based on the consistency of the handwriting, that about 10 pages in the Obama petition were filled in by the same person, and another person apparently filled in nine pages. He said it’s possible another two people filled in several more pages. Each page in the petition contains up to 10 signatures. “It’s obvious. It’s just terribly obvious,” Speckin said, pointing to one of the writer’s idiosyncrasies repeated throughout the petition’s pages. The full extent of the fakery, which appears to be limited to the state’s 2nd Congressional District and specifically St. Joseph County, is not yet known. The situation, however, calls into question whether either Clinton or Obama, both of whom were U.S. senators at the time, should have been on the Indiana primary ballot. Example: See writing samples from the petitions that clearly illustrate the same handwriting across multiple pages. Candidates for president, senator and governor must submit ballot petitions signed by at least 500 registered voters in each of Indiana’s nine congressional districts to quality for the statewide ballot. Clinton edged Obama by about 2 percentage points in the Indiana primary but lost the overall Democratic nomination. Obama, of course, went on to be elected president, defeating Republican Sen. John McCain in the general election. County voter registration offices are responsible for verifying that those who sign the petitions are registered voters in that county. Staff in the offices check to make sure each signer’s name, birth date and home address match the information on his or her voter registration card. The chairs of the two major parties, Democrat and Republican, each appoint one member to serve on the two-member voter registration board in the county. They also appoint a first deputy and three staff members each to work in the voter registration office. In St. Joseph County, certified petitions are stamped, initialed and signed by both members of the board — Republican Linda Silcott and Democrat Pam Brunette, in the case of the Obama and Clinton petitions — and then returned to the person who submitted the petition. That person is then responsible for delivering the petition to the state Election Division by noon on the final day candidates can declare they’re running for office. In 2008, that deadline was Feb. 18.